At first, your purchase of an actual tree for this year’s Christmas seemed like an ingenious idea. However, as January begins its steady creep towards your doorstep, you start perceiving the innocent fir as being more of a burden than anything else. Its disposal soon becomes a tricky matter – the distance from your property to the nearest recycling centre is discouraging, to say the least. Your local council, on the other hand, urges to leave your festive tree next to your bin outside on a specific day, which may not be the most convenient thing for you to do. 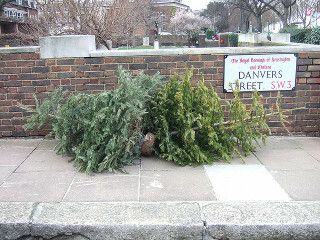 Save yourself the trouble and book Christmas tree collection in London with Rubbish Begone! Watch as a proficient team of rubbish collectors visits your home, loads your Christmas tree in their van and takes it for recycling with dexterity, which can only rival that of Santa’s elvish helpers! Dial 020 3404 1106 today and our 24/7 customer support will make sure to supply you with an immediate free quote! How Will You Benefit from Our Christmas Tree Collection? A reliable and same-day service that will ensure the proper recycling of your holiday tree. Experienced and reference-checked cleaning technicians. Avoiding council fees by choosing a day that best suits your daily schedule. Flexible price rates with included transportation and disposal. Please make sure to remove any decoration, such as lights, tinsel or Christmas baubles from the fir before the team arrives at your doorstep. Stands and pots should be removed as well. We can collect those items separately of your Christmas tree. Keep in mind that our Christmas tree disposal service in London applies to artificial trees, too. However, because of their material, artificial trees cannot be recycled, so if in good condition, we recommend donating your ‘fake’ tree to charity or giving it to a friend rather than disposing of it. We can also clean your rubbish collection bins and areas, as we know how filthy they get after holidays. …that in the UK alone, a large portion of the 8 million Christmas trees that are bought every year end up generating over 12,000 tonnes of additional rubbish? Simply put, that’s almost twice the weight of the Eiffel tower! Now, imagine this on a global scale! Call Us Now for an Efficient Christmas Tree Collection! Your solution is one call away – simply dial 020 3404 1106 and the polite advisers will help you out with the booking and offer you a complimentary price estimate. If you prefer contacting us online instead, we have you covered as well – all you need to do is to either enter our website and fill in our booking form or make use of our integrated instant chat feature and you are all set!